World Schooling from Home! Teach Culture and Geography with THIS! 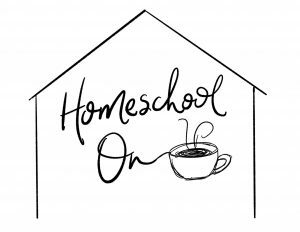 You are here: Home / Socials / World Schooling… from Home! I’m sure you have heard the popular form of education: world schooling. 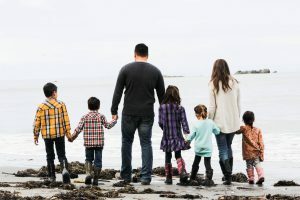 World schooling is essentially a form of homeschooling whereby your children are learning about the world around them through taking trips and traveling the world. While I’m sure we can all agree that this would be the most amazing way to learn about art, geography, culture, foreign languages, etc… the reality is for the vast majority of us, this is and never will be an option. Travel (especially with large families) is expensive, many of our husbands can’t travel for extended periods of time. So we settle with traditional homeschool books and curriculum and try to make learning come alive to our kids from home as best we can. But I have found a curriculum that will make world schooling possible for us all! I have found a curriculum that will help your children not just learn about but rather experience different cultures! A World Schooling Philosophy in an Easy-to-Use Curriculum! Observation:Look carefully at illustrations, photographs, charts, or videos to draw conclusions about a culture/people. Listening: Listen to the experiences and daily life challenges of others in fictional and nonfictional books. Discussion: Discuss the implications of what you’ve read, and/or what you see, in the lives of people or groups. Comparing: Determine how the given culture compares or contrasts to your own experiences. 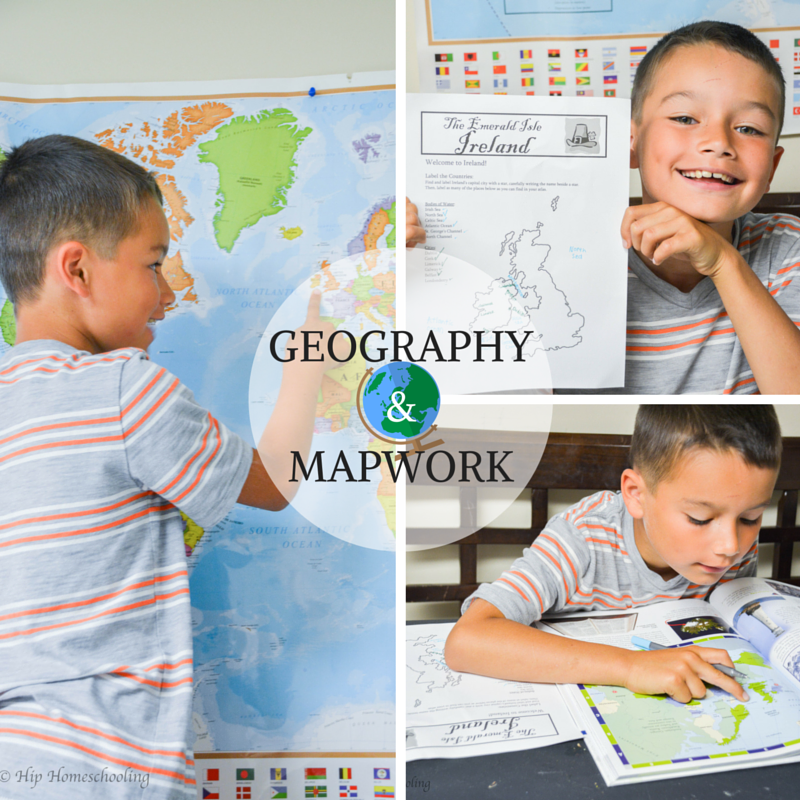 Map Exploration: Peruse maps to locate countries, natural features and landforms, and manmade landmarks. Interactive Mapwork: Place figures onto country maps to utilize knowledge of geography and culturally relevant sites. Review and Repetition: Practice your knowledge of key concepts by utilizing resources such as country flashcards. Experience: Experience what you’ve learned by trying it yourself through active learning opportunities. Journaling and Notebooking: Reinforce what you know by drawing, answering questions, and filling out interactive pages. Quizzes/Tests: Show what you know by answering questions or participating in oral review, quizzes or tests. Worksheets: Complete workbook-style pages to reinforce rote knowledge of a subject area or skill. Narration: Narrate about what you’ve read to demonstrate your knowledge and understanding. Click to view some sample pages! Children Around the World is written from a Christian worldview, and is a full theme package that will cover your Social Studies, Geography, Bible, and even a lot of your Language Arts (because of the written worksheets and journaling) for multiple children at once! It will help your children develop empathy and understanding about different cultures as well as some of the suffering and hardships that children around the world face. You will explore 30 different countries around the world in this comprehensive curriculum and the beauty is that you can be as involved and hands-on as you want to be… or use it as a very simple open-and-go program depending on your family dynamics and learning styles. When I asked the kids which country they were the most interested in, they decided they wanted to learn about Ireland, so we jumped right to that section. Because we really wanted to dive deep into the curriculum and explore the culture and geography of that area, I took a bit of time to sit down and plan a cultural gathering, order some books from the library, and schedule everything we wanted to do from the guide into my planner. Again, you could do no planning and just open and go using the journaling pages, the books/guide, and the notebooking resources. How in-depth you go completely depends on you, but this will give you an inside look at just how fun this program is! While I was planning our Irish festival, we began learning about the country. There are exclusive notebooking pages to learn about the flag, dress, important places, and more! 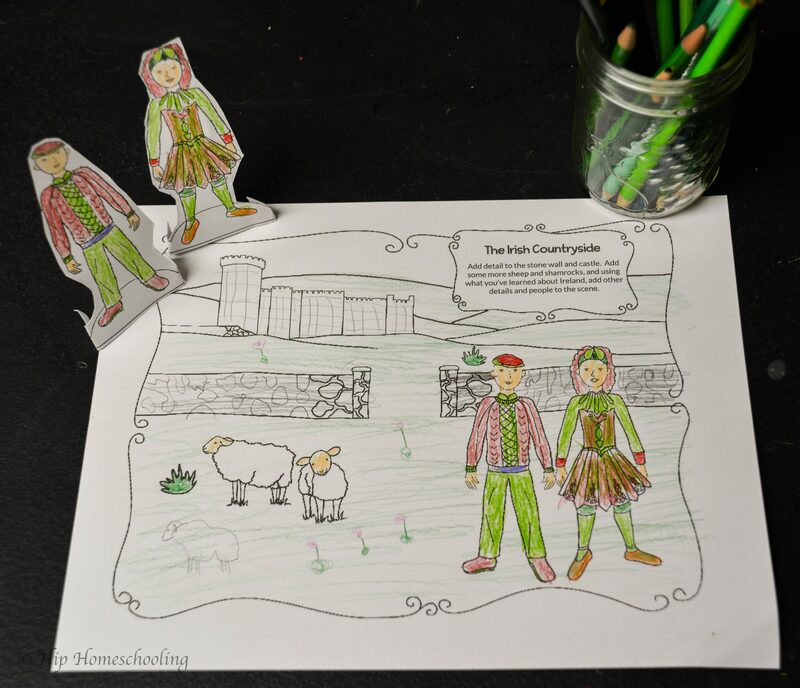 Because my children are in the younger range (preschool-grade 4) we loved the doodle placemats and the native costume standups (my kids loved playing with these and putting on little skits). It gave them something to color and work on while I was reading them a poem or just teaching about some of the culture, etc. We spent quite a bit of time talking about the geography of Ireland and looking at both our world globe as well as our various world atlas’. Because I am dealing with a broad age range, my kids approached the lessons at varying levels. Some of them just listened in, others orally learned the basics of the geography, and my oldest son did the labelling and map work that is included. This isn’t just a map to label, there are questions and tons of details that make this incredibly comprehensive, which is great if you have older children and are looking to really challenge them. Once we had a good understanding of the culture and geography of Ireland, we were ready to plan for our Irish festival. 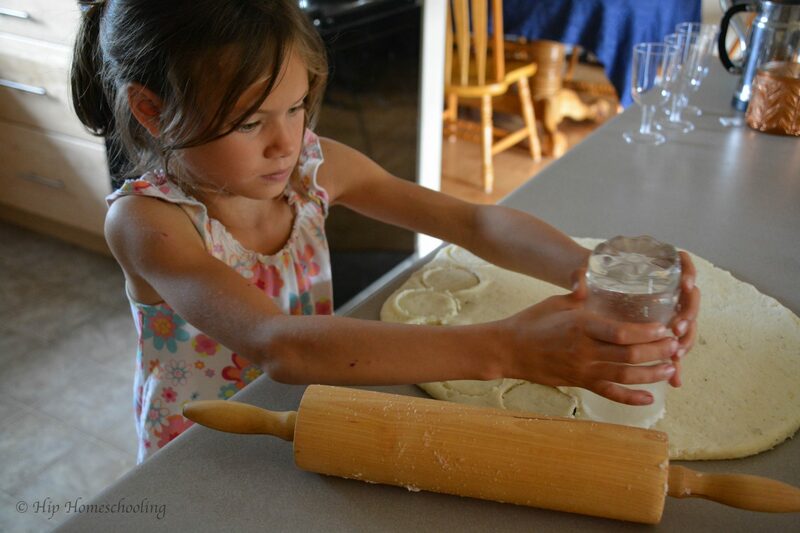 We planned our meal together (there are a whole bunch of recipes to choose from) as well as some activities the kids wanted to try. There is a cultural planning guide to help you plan your night as well as Fun and Traditions of Many Lands that give lots of activity suggestions to experience from that country. I included the kids in this planning and let them hand pick what interested them. We began with preparing our traditional Irish dinner: Irish stew and potato cakes. 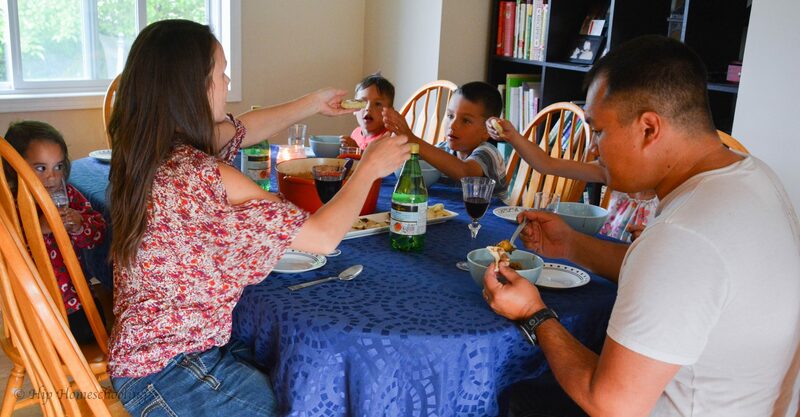 I kept the kids involved in every part of this process, from setting up the table complete with special drinks and a candle, to helping me cook the dinner. Not all of my kids liked the food, but that wasn’t the point. The point was to experience something different. To learn how to respect other cultures, even in the form of a dinner. We talked about why it is important to try something, to not express (loudly) our distaste, how to be polite and keep an open mind. Not to mention the discussion and laughs we had in the process. 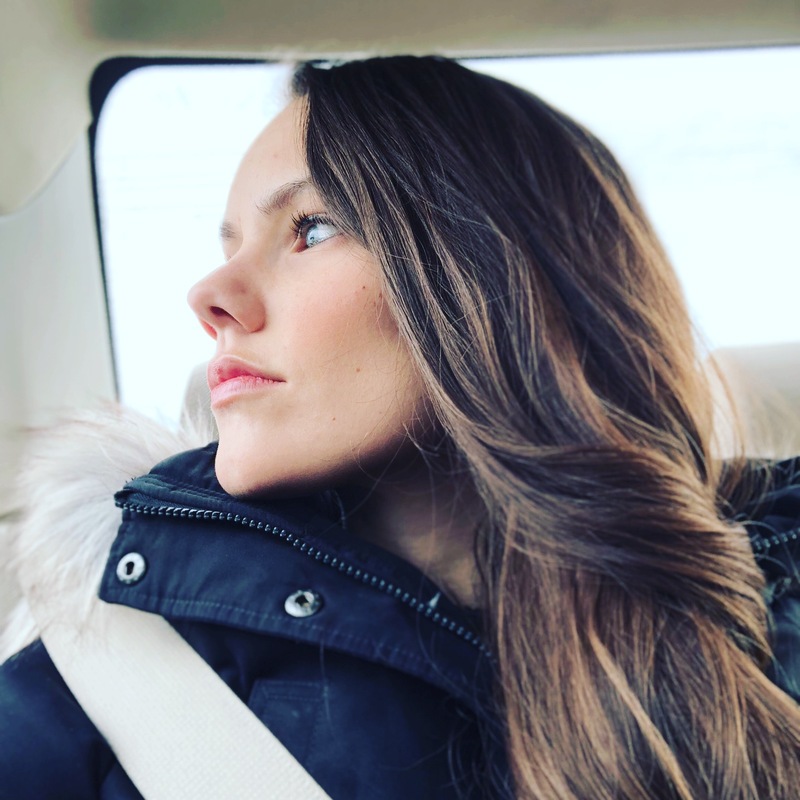 We listened to some traditional celtic music while we ate as well, trying to really create a full experience that our children would remember. I loved that this included everyone. 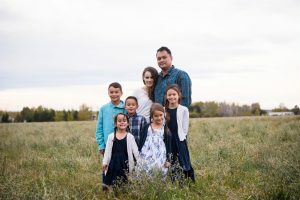 This curriculum wasn’t just about me and one or two children, it was about our whole family! Dad was right in there with us, the little kids were learning from their siblings, it was a ton of fun! After dinner and cleanup, we played hot potato which was quite honestly hilarious! 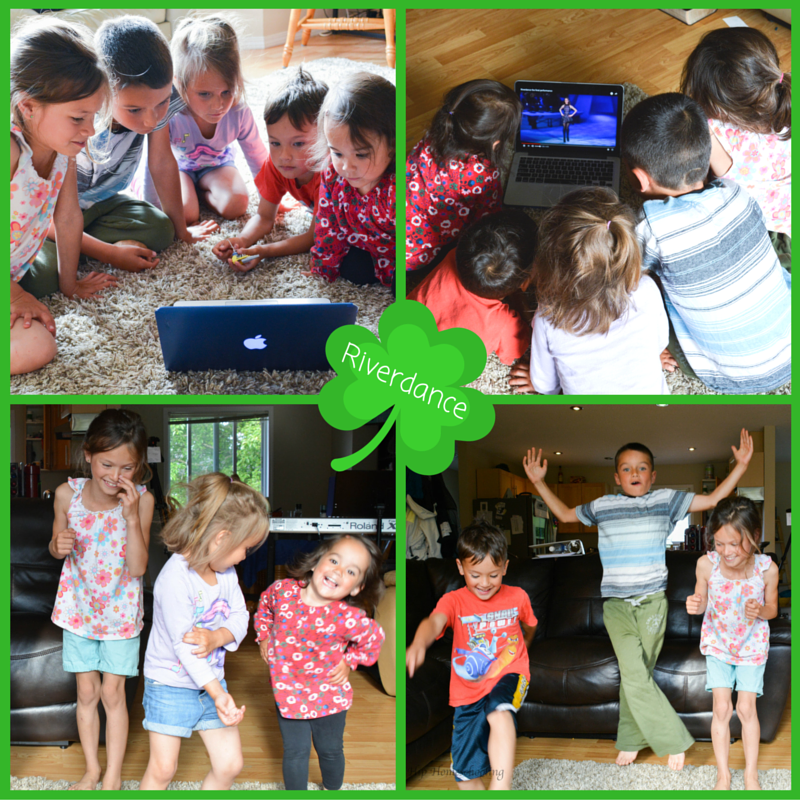 It is such a simple game but another fun way for my kids to immerse themselves in Irish culture and games. My 2 year old LOVED this and watching her engage with us was one of the highlights of our night! Are you loving it as much as I am? 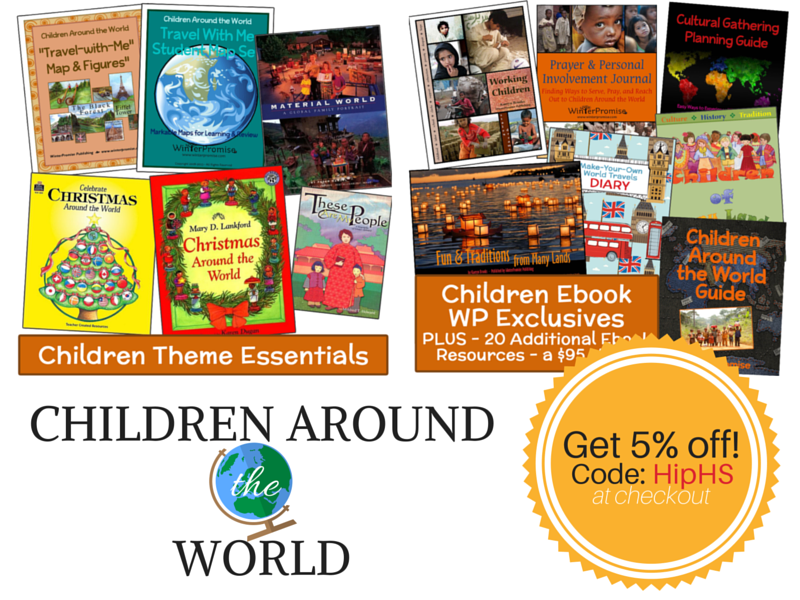 If you want to find out more information about WinterPromise or this amazing theme, Children Around the World, head on over to their website HERE and don’t forget to use coupon code HipHS for 5% off any order! The package price varies based on if you are doing print or digital and if you are purchasing everything or choosing to get some books from the library. The packages are completely customizable to give you plenty of options to work for your family! The main package starts at just $258 and can be used for your entire family to check off 4 subjects in one! 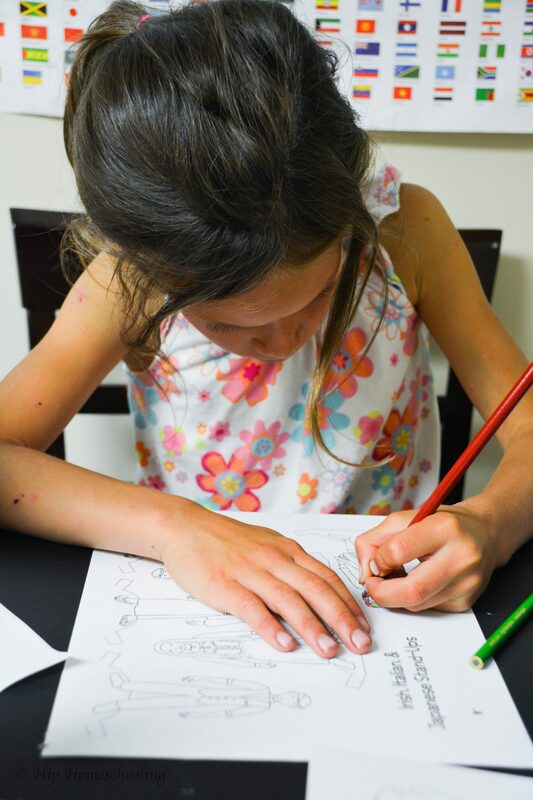 It is a great way to save money on your homeschooling journey, to make learning more experiential and hands and and to make it more of a family experience, rather than individualized learning. One of my favorite aspects of the program was the prayer and personal involvement journal. It is a great way to help your kids get involved with their community, to take action. It really takes this program to the next level. Your kids will be reading about suffering children around the world. They will begin to recognize how blessed we are in North America and pray for children around the world who are less fortunate. There are ideas to fundraise and support these children, to volunteer and do outreach in our local communities and more! Take a look at some sample pages here to get a better idea of what it looks like. What are your thoughts on World Schooling?